John Steinbeck's The Grapes of Wrath stands as a pivotal piece of American literature. The story follows the Joad family (and thousands of others) as they are driven from the Oklahoma farm where they are sharecroppers during the Great Depression. The drought, economic hardship, and changes in financial and agricultural industries send them searching for dignity and honest work in the bountiful state of California. The book was first published in 1939, by The Viking Press. Commonly found flaws in the first edition of this work include age tanning, rolling of the spine, and chips to the edges of the pages and boards. Signed copies of a First Edition in excellent condition can fetch over $20,000. The first UK edition was printed by William Heinemann, also in 1939. Signed First UK editions are also collectible, often sold for over $5,000 USD. New York: The Viking Press,, 1939. Octavo. Original buff cloth, titles to spine and pictorial design to covers in dark brown, endpapers decorated with the sheet music for Battle Hymn of the Republic, top edge yellow. With the dust jacket. Housed in a custom blue cloth chemise within blue half morocco box, spine lettered in gilt, blue cloth sides. A near-fine copy in the bright dust jacket, with a couple of tiny chips and trivial scuffing at extremities. First edition, first printing. A superb association copy, presented by the author to his sister Elizabeth Steinbeck, inscribed on the front free endpaper: "for Beth with love John". Elizabeth Steinbeck (1894-1992), John's elder sister, "understood the importance to her brother of family loyalty... Known as Beth, she enjoyed success in San Francisco while working as a purchaser and manager for a department store... In 1925, Beth helped her brother John by playing host to him when he arrived in New York empty handed. Her husband was able to get John a job with the James Stewart Construction Company working on the construction of Madison Square Garden (the predecessor to the current venue), where he hauled cement to bricklayers" (A John Steinbeck Encyclopedia, p. 6). Elizabeth later played an important part in the Valley Guild, the non-profit organisation that maintains the Steinbeck family home in Salinas, and donated many family artefacts to the museum. The Grapes of Wrath, Steinbeck's masterpiece, is widely regarded as the supreme literary achievement of the Depression era. The film adaptation of Darryl F. Zanuck, produced the following year, is also readily ranked among the greatest American films of the century. The present book passed by descent from Elizabeth Steinbeck [married name Ainsworth] to her daughter Elizabeth Ainsworth Wiltshile (1930-2005), was sold at her sale in Bonhams New York on the 18 February 2007 (lot 317), thereafter entered a private collection, and was entered into Sotheby's auctions in 2015 and 2018. New York: The Viking Press,, 1939. Octavo. Original buff cloth, titles to spine and pictorial design to covers in dark brown, endpapers decorated with the sheet music for Battle Hymn of the Republic, top edge yellow. With the dust jacket. Housed in a custom blue cloth chemise within blue half morocco box, spine lettered in gilt, blue cloth sides. A very good copy in the dust jacket, toned, chips and splits expertly repaired on verso. First edition, first printing. A superb presentation copy, inscribed by Steinbeck to the producer of the film adaptation of The Grapes of Wrath, Darryl F. Zanuck, on the front free endpaper: "For Darryl Zannuck [sic] with thanks for a fine picture John Steinbeck 1939 Los Gatos". Steinbeck first watched Zanuck's film at Twentieth-Century Fox on 15 December 1939. He wrote an adulatory letter to his agent Elizabeth Otis shortly afterward saying that "Zanuck has more than kept his word. He has a hard, straight picture in which the actors are submerged so completely that it looks and feels like a documentary film and certainly has a hard, truthful ring. No punches were pulled? In fact, with descriptive matter removed, it is a harsher thing than the book, by far" (cited in Eagan, America's Film Legacy, p. 310). Zanuck's film adaptation, which was publicly released on 24 January 1940, is widely regarded as one of the great American films of the century, and was one of the first 25 films selected for preservation in the United States National Film Registry by the Library of Congress in 1989, for its cultural, historical and aesthetic significance. Both the book and the film are seen as being among the key artistic expressions of the spirit of Depression-era America. first edition. NY, Viking, 1939, first edition, first printing, dust jacket. Hardcover. His masterpiece and winner of the Pulitzer Prize in the correct first issue dust jacket as illustrated by Elmer Hader, this is an Author Presentation/Association Copy being inscribed to Vincent Sheean ("For Vincent Sheean/John Steinbeck"), Sheean was a published author as well as a newspaper reporter who was a favorite drinking buddy of Ernest Hemingway and who had a knack of being in the right place at the right time for news events, he is mentioned in a Hemingway-related story in Jack Benson's biography of Steinbeck (The True Adventures of John Steinbeck, Writer), below Steinbeck's inscription Sheean has written "Although it is signed to me, Mr. Steinbeck/intended this book to go for/the Spanish intellectuals/in exile--/Vincent Sheean," signed presentation copies of The Grapes of Wrath are scarce, Goldstone & Payne A12a, see Morrow 106. Very good indeed, now housed in a custom clamshell case. New York: The Viking Press, 1939. First edition, with "First Published in April 1939" on copyright page and first edition notice on the front flap of the dust jacket. Octavo, original beige cloth. Presentation copy, inscribed by the author on the front free endpaper, "For Florence Means John Steinbeck." The recipient was a secretary at The Viking Press, where this title was published. Fine in a near fine dust jacket with light rubbing to the extremities. Jacket design by Elmer Hader. Housed in a custom half morocco clamshell box. A nice example with noted provenance. "The Grapes of Wrath is the kind of art thats poured out of a crucible in which are mingled pity and indignation Its power and importance do not lie in its political insight but in its intense humanity [It] is the American novel of the season, probably the year, possibly the decade" (Clifton Fadiman). It is the basis for the 1940 John Ford directed film, bearing the same name starring Henry Fonda. It is widely considered as one of the greatest American films of all time. In 1989, this film was one of the first 25 films to be selected for preservation in the United States National Film Registry by the Library of Congress as being "culturally, historically, or aesthetically significant." Listed by Modern Library as one of the 100 best novels of the twentieth century. New York: Viking Press, 1939. First Edition. A bit better than very good in dust jacket; in a full-leather clamshell box. Previous owner’s contemporary signature; signed by Steinbeck on the front free endpaper. New York: Viking Press, 1939. First Edition. A fine copy in an immaculate price-clipped dust jacket with only the most minute wear. Condition: First Edition. A fine copy in an immaculate price-clipped dust jacket with only the most minute wear. The Viking Press, New York, 1939 First Edition, First Printing SIGNED by John Steinbeck on a laid in limitation page. This TRUE FIRST EDITION has the words "First Published in April 1939" printed on the copyright page. A wonderful copy. This First Printing price clipped dustjacket dustjacket has the words "First Edition" printed on the front flap. This ORIGINAL dustjacket is rich in color with slight wear to the edges. The book is bound in the ORIGINAL publisher's tan cloth and is in excellent condition. The binding is tight with NO cocking or leaning with minor wear to the edges. The pages are clean with NO writing, marks or bookplates in the book. A fabulous copy SIGNED by the author.. Signed by Author(s). 1st Edition. Hardcover. Fine/Fine. first edition. NY, Viking, 1939, first edition, first printing, dust jacket. Hardcover. 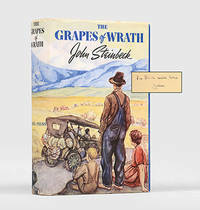 No book is more identified with John Steinbeck than this masterpiece which won the Pulitzer Prize for fiction and which was the source for the film version directed by John Ford that starred Henry Fonda as Tom Joad and which won Jane Darwell an Academy Award for her portrayal of Ma Joad, the book was also the source for the Tony Award-winning Broadway play, one of the true high spots of 20th Century literature, jacket designed by Elmer Hader, this is an incredibly scarce Review Copy with review slip from Viking, this is the only review copy seen by this bookseller in more than 50+ years of being involved in all things Steinbeck, see Goldstone & Payne A12a, see Morrow 107. Fine in a jacket with a couple of small tape ghosts from where the review slip was previously affixed, jacket is otherwise clean, bright, and fine. Viking Press, 1939 A fine first edition in a fine dust jacket (with First Edition stated on the lower corner of the front flap of the dust jacket). Housed in a custom made collector's clamshell case with tooled quarter leather and gilt lettering and decoration.. 1st Edition. Hardcover. Fine/Fine. The Viking Press, New York, 1939 First Edition, First Printing with the words "First Published in April 1939" printed on the copyright page. A spectacular copy. This ORIGINAL dustjacket is rich in color with NO chips or tears. This First Issue dustjacket has the words "First Edition" printed on bottom front flap of the dustjacket. The book is in fantastic shape and appears UNREAD. The binding is tight with NO cocking or leaning and the boards are crisp. The pages are exceptionally clean with NO writing, marks or bookplates in the book. A superb copy of this TRUE FIRST EDITION in collector's condition. Includes a custom clamshell slipcase for preservation and presentation.. 1st Edition. Hardcover. Fine/Fine. Viking Press, 1939 Inscribed by John Steinbeck on the title page. A second printing before publication. Very good in a very good dust jacket. Book has slightly tanned spine and a small (less than an inch) tear in the spine cloth near the front panel. Jacket has reviews on the front flap and is from a later printing. Bottom corner of the front flap is clipped, where it would have said what printing it is. We will provide a certificate of authenticity. Housed in a custom-made collector's slipcase.. Inscribed by Author(s). 2nd Edition. Hardcover. Near Fine/Near Fine. The Viking Press, New York, 1939 First Edition. First Printing. A magnificent dustjacket that has is vibrant in color with slight wear to the edges. This original first issue dustjacket has the "First Edition" on bottom front flap present. The book is in great shape. The binding is tight, and the boards are crisp with slight wear to the edges. The pages are clean and there is no writing, marks or bookplates in the book. Overall, a lovely copy of this true first edition housed in a custom clamshell slipcase for preservation. We buy Steinbeck First Editions.. 1st Edition. Hardcover. Fine/Fine. Viking, New York., 1939. First edition. Octavo. pp. [vi], 619. Slight bump at head of spine. Slight spotting at edges. Very good indeed in very good pictorial first issue dustwrapper, by Elmer Hader, with professional repairs made to several closed tears at edges. Preserved in a fine custom-made cloth drop-back box with leather title-labels on spine and upper panel. New York: Viking, 1939. First edition. 8vo, publisher’s original pictorially decorated tan cloth in original first issue dustjacket, with price and "First Edition" statement both present. 619. A handsome, bright and clean copy, the dustjacket whole and without tears, light evidence of shelving over time, the backstrip of the dustjacket just a touch mellowed by age, clean and bright internally, solid and very well preserved. AN IMPORTANT FIRST EDITION AND PERHAPS THE GREATEST BOOK WRITTEN BY THIS NOBEL PRIZE WINNING AUTHOR. John Steinbeck won the Pulitzer Prize for this novel of migrant workers in America. The story of the Joad family, simple people living close to nature, whose lives are disrupted by the malevolent forces of drought, market conditions and human creed. The novel graphically demonstrates the dangers to society when the vital like between rural man and the Earth is broken. The condition of this copy, in the pictorial jacket, is quite pleasing indeed. first edition. n.p., 20th Century-Fox, 1940, first edition. A complete set of 11X14-inch color lobby card posters for the original release of this classic story and classic film which was directed by the famed John Ford and which starred Henra Fonda as Tom Joad, Jane Darwell as Ma Joad, and John Carradine as Casy, the set also includes its original printed housing envelope which is probably even more scarce than the posters, the fragile housing envelope is plain brown and is printed with the film title, Steinbeck's name, Fonda's name, etc. none of these posters were in the Adrian H. Goldstone collection, but see Goldstone & Payne E6, not recorded by Morrow, extremely scarce, especially as a complete set and with the housing envelope. While there are pin holes in some corners from theatre mounting, as usual, these posters are uniformly clean, bright, and fine. New York: Viking Press, 1939. First Edition. A fine copy in a dust jacket with very light wear. This Pulitzer Prize winning novel remains the most significant novel of the Great Depression, and its 1940 film version, winner of several Academy Awards, remains that troubled period’s finest cinematic interpretation. New York, The Viking Press ., 1939. First edition. 8vo. Full modern red morocco, gilt covers with double gilt rule panel surrounding gilt grape and grape vine, a.e.g., spine with raised bands. Red cloth dropbox. Fine, fresh copy. No signatures or bookplates. With a fine foredge painting, being a variation of the dust jacket image of a farm family on the roadside observing migrants heading west.. 1st Edition. Hardcover. Fine/No Jacket. New York: Sun Dial Press, 1941. Reprint edition. A very good copy in dust jacket; in a custom cloth clamshell box. Presentation copy; inscribed by the author to William Faulkner's sister-in-law, "For Mrs. John Faulkner, John Steinbeck." New York: Viking Press. 1939. First Edition; First Printing. Hardcover. Very Good in a Very Good dust jacket. This original First Issue dust jacket with the $2.75 price present on the front flap and "First Edition" printed on the bottom flap, tan cloth, titles to spine and pictorial decoration across boards and spine in brown and the sheet music endpapers. Dust-jacket designed by Elmer Hader. A bright copy. ; 8vo 8" - 9" tall . New York: Viking, 1939. First Edition, First Issue. From the library of Harpo Marx, the endearing clown of the Marx Brothers comedy team, and his wife actress Susan Fleming Marx, former member of the Ziegfeld Follies and star of early talking films like Million Dollar Legs with W.C. Fields. With a charming bookplate illustrated by Susan Marx with a drawing of Harpo in his comic character which reads: “FROM THE LIBRARY OF HARPO & SUSAN MARX.” Fine clean copy in a near fine bright dust jacket with a few small chips, a few tiny tears, and darkening at the spine, and with some minor dust soiling and reinforcement by an expert paper conservationist. Winner of the Pulitzer Prize. An American literary landmark and the basis of the acclaimed film starring Henry Fonda directed by John Ford. Seller: James Pepper Rare Books, Inc.
New York: The Viking Press,, 1939. Octavo. Original buff cloth, titles to spine and pictorial design to boards in dark brown, yellow and brown decorated endpapers, top edge yellow. With the dust jacket. An exceptionally bright copy in the jacket with just a hint of rubbing to spine ends and tips. First edition, first printing, of Steinbeck's masterpiece and one of the great American novels of the 20th century. The fine jacket design is by Elmer Hader, known primarily as a children's book illustrator (joint winner with his wife, Berta Hoerner Hader, of the Caldecott Medal in 1948 for The Big Snow): apparently Steinbeck was so taken with their book Billy Butter (1936) that he requested that Elmer Hader design the cover for The Grapes of Wrath; the illustrator going on to work on two other Steinbeck books, East of Eden (1952 and The Winter of Our Discontent (1961). New York: The Viking Press, 1939. Fine/Near Fine. First edition. Fine in near fine dustwrapper with a short tear and a little rubbing. A nice, bright copy of this Pulitzer Prize-winning novel of an Oklahoma family's migration to California during the Depression. Basis for the John Ford film featuring Henry Fonda as Tom Joad. Ford and supporting actress Jane Darwell won Academy Awards; Fonda was nominated but lost to Robert Donat in Goodbye, Mr. Chips! Steinbeck's masterpiece and literature's lasting testament to the Great Depression, it was singled-out in his citation for the Nobel Prize decades later. New York, The Viking Press, 1939., 1939. Publisher's dummy. 8vo. preliminary pages, 10 text pages, remainder blank. Original tan buckram, stamped blue on spine and upper cover, acetate dust jacket. Very good. Enclosed in a later blue cloth slipcase. Differences between the published (trade) edition include: variant title page (different typefaces, with Viking Press vignette and date); blank title page verso (no copyright information); extra lines of type on pages 5 and 6; top edge stained blue instead of yellow. See Goldstone & Payne A12a and Morrow catalogue #104. The 1940 filmed version won 2 Academy Awards (for Best Director and Best Supporting Actress).. 1st Edition. Hardcover. Very Good/Dust Jacket Included. New York: Viking, 1939. First Edition, First Issue. Fine clean copy with a tiny bookstore label to the bottom edge of the left rear pastedown in a very good bright dust jacket with a bit of extremely minor sunning at spine and the barest hint of edge wear. Winner of the Pulitzer Prize. An American literary landmark and the basis of the acclaimed film starring Henry Fonda directed by John Ford. Viking, 1939 First Edition, First Printing. An attractive dustjacket that is vibrant in color with minor wear to the edges. This original First Issue dustjacket has the $2.75 price present on the front flap and more importantly the words "First Edition" printed on the bottom flap. The book is in wonderful condition. The binding is tight, with light wear to the panels. The pages are clean with no writing, marks or bookplates in the book. Overall, a lovely copy of this TRUE FIRST EDITION with all the First Issue points. We buy Steinbeck First Editions.. 1st Edition. Hardcover. Fine/Near Fine. New York: Viking, 1939. First Edition, First Issue. Very good plus to near fine copy in a bright dust jacket with the barest hint of edge wear and a few minor mends by an expert paper conservationist. Winner of the Pulitzer Prize. An American literary landmark and the basis of the acclaimed film starring Henry Fonda directed by John Ford. The Viking Press, New York, 1939 First Edition. First Printing. A spectacular dustjacket that has benefited from light restoration. The end result is a beautiful dustjacket that is rich in color with no chips, tears or pieces missing. This original first issue dustjacket has the "First Edition" on bottom front flap present and the original $2.75 printed on top flap. The book is in nice shape. The binding is tight, and the boards are crisp with light wear to the spine and edges. The pages are clean and there are no marks or bookplates in the book. Overall, a splendid copy of this true first edition in collector's condition. As a bonus, the book has a nice Adrian Homer Goldstone bookplate to the front endpaper. Goldstone was the author of Steinbeck's bibliography. Includes a custom clamshell slipcase for preservation.. 1st Edition. Hardcover. Fine/Fine. first British edition. London, Heinemann, 1939, first British edition, first printing, dust jacket. Hardcover. With the very scarce wrap-around band noting this was a Book Society Fiction Choice, this copy with a small slip affixed to the title page that is Inscribed by John Steinbeck ("For L. Downing/John Steinbeck"), Goldstone & Payne A12b, Morrow 108. Near fine. New York: The Viking Press, 1939. First edition - so stated on dust jacket flap with price of $2.75. Book fine with trifling spot in front gutter, dust jacket with minor edge rubbing and two small chips to spine foot. First edition - so stated on dust jacket flap with price of $2.75. (vi), 619p. In publisher's tan cloth with spine titles in purple and with pictorial design extending across the lower portion of both covers and spine, with Battle Hymn of the Republic printed on endpapers. Awarded Pulitzer Prize in 1940. New York: The Viking Press,, 1939. Octavo. Original buff cloth, titles to spine and pictorial design to boards in dark brown, endpapers decorated with the sheet music for Battle Hymn of the Republic, top edge yellow. With the dust jacket. Jacket spine only slightly toned, a few nicks and chips, dark mottling to top edge of book block. A very good copy with the jacket in superior condition. First edition, first printing, of Steinbeck's masterpiece and one of the great American novels of the 20th century. The fine jacket design is by Elmer Hader, known primarily as a children's book illustrator (joint winner with his wife, Berta Hoerner Hader, of the Caldecott Medal in 1948 for The Big Snow): apparently Steinbeck was so taken with their book Billy Butter (1936) that he requested that Elmer Hader design the cover for The Grapes of Wrath; the illustrator going on to work on two other Steinbeck books, East of Eden (1952) and The Winter of Our Discontent (1961). Viking, 1939 First Edition, First Printing. This First Issue dustjacket has publisher's $2.75 printed price present and the words "FIRST EDITION" printed on the bottom flap with minor wear to the spine. The book is in great shape. The binding is tight with slight wear to the edges. The pages are clean, with NO writing, marks or bookplates in the book. A lovely copy in collector's condition.. 1st Edition. Hardcover. Fine/Near Fine. NY: Random House, 1941. First Modern Library Edition. Hardcover. Very Good. . NY: Random House, 1941. First Modern Library edition. Worn dustjacket (supplied), cloth stained and soiled (mostly at spine and not affecting internals), still solidly bound. Inscribed by Steinbeck to Moss Hart on the half title: For Moss Hart this book is touchingly inscribed - with pleasure and gratitude for Lennie knows what. John Steinbeck. Lennie is the key word that links Steinbeck to Hart, as Lennie Small is the tragic character in Of Mice and Men, and it is Moss Hart's principal collaborator, George S. Kaufman, who adapted the novella with Steinbeck for the stage in 1937. The inscription, unfortunately undated, can be no earlier than 1941 (when this edition was published) so it was not executed at the same time Steinbeck and Kaufman worked together. The back story for the inscription is provided by journalist and radio producer Don Swaim, resident of Bucks County and chairman of the Writer's Workshop there, on his excellent website. Bucks County was a favorite area for "country homes" for Manhattan writers, artists and "theater people" in the 1930s-1950s. Moss Hart and his wife Kitty Carlisle owned Fairview Farm in Holicong and Kaufman and his wife Beatrice were not far away at their estate, Cherchez La Farm. Steinbeck had written most of the short novel Of Mice in Men in dialogue form and he thought it would be easy to adapt to the stage. Kaufman had secured the stage rights. Steinbeck had written an adaptation but Kaufman saw that it needed immediate work, as the play was to be staged that fall. He invited Steinbeck to join him at his farm where in the later part of August 1937 they rewrote together Of Mice and Men. The degree to which Kaufman re-shaped the play is an open question. A comparative analysis by Jackson J. Benson in The Short Novels of John Steinbeck: Critical Essays With a Checklist to Steinbeck Criticism suggests that, even though the dialogue is about 80% directly from the novella, the narrative drama of the stage version was partly achieved by expanding the dialogue of Curley's wife, mistakenly killed by Lennie, and making her more sympathetic. The play opened in November to critical acclaim, edging Our Town for the Drama Critics Award, and spawned a successful movie version two year later. Steinbeck tired of the New York scene and returned to California to write The Grapes of Wrath. He never commented or wrote publicly about his experience with Kaufman, although in his later years well after Kaufman's death, he consistently credited Kaufman with the play's success. Still, Steinbeck's experience with Kaufman in August 1937 could not have been easy. He had written Of Mice and Men almost as a 'play-novella" and likely anticipated an easy transfer from page to stage. Thus, the inscription raises many questions for Steinbeck biographers and scholars. Had Steinbeck, commiserated with Hart, as the inscription suggests, who was just down the road from Kaufman about Hart's partner's reworking of his work? ("Damnit, Moss, what is George doing with my story?") Does Steinbeck refer to Lennie because he wanted to "protect" his tragic figure from Curly's wife becoming more sympathetic in Kaufman's hands? Is the reference to Lennie an allusion to how no one, perhaps even Steinbeck himself, could understand what was going through the mind of a person like Lennie? The inscription is also distinctive in that it is not common for Steinbeck to make explicit references to characters in his books in his inscriptions. No matter how dear the character Lennie may have been to Steinbeck and whatever Steinbeck meant in the inscription, this discovery surely is a vital artifact of Steinbeck's career and of American stage and film history both. (The provenance of the book is clear. By the late 50s, Kitty Carlisle had grown tired of the maintenance of the Bucks County farm and wanted to spend more time in New York and, in an eagerness to return to her and Moss' Manhattan apartment on a per. New York: Viking Press, 1939. A First Edition, First Printing. Hardcover. Fine/Near Fine. Fine in a near fine unclipped dust jacket. With "First Published in April 1939" on copyright page, "First Printing" on the dust jacket and with the $2.75 price present on the flap. Rear paste down with a small rubbed spot on bottom near spine where a bookseller's sticker was removed. Jacket with very light wear to spine ends, a tiny snag at the top of the front flap, and just a bit of darkening to the spine, much less than commonly seen. The Viking Press, New York, 1939 First Edition, First Printing. An attractive First Issue dustjacket that has the words "First Edition" printed on the front flap. This ORIGINAL dustjacket has NO chips or tears with some repair. The book is bound in the publisher's original cloth. The binding is tight with light wear to the spine and edges. The pages are clean with NO writing, marks or bookplates in the book. A lovely copy.. 1st Edition. Hardcover. Near Fine/Fine. Macmillan, 1939. Book. Fine. Decorative Cloth. First Canadian. 8vo - over 7¾" - 9¾" tall. Fine copy in a near fine price clipped jacket.Macmillian on spine of jacket and also on spine of book replacing Viking..Title page"Toronto:the Macmillian Company of Canada Limited, at St. Martin's House. "This copy is a Second Printing Before Publication. Fresh Copy.Small chip in Crown.An Incredibily Rare Edition.My First One in 25 Years of Collecting.The jacket is lightly Used. Awesome Copy. So much Rarer than Viking Edition..
Viking, 1939 A fine first edition in a very good first edition dust jacket. First Edition slug on front flap. Housed in a custom-made collector's slipcase.. 1st Edition. Hardcover. Fine/Very Good. NY: Viking, 1939. First Edition. 8vo, pp. 619. A very nice copy with light browning to endpapers, in a good dj rubbed and worn at the folds and nicked to the extremities) First issue with "first edition" on the dj. flap. Goldstone and Payne A12a; Morrow 107. This book won the Pulitzer Prize for fiction and which was the source for the film version directed by John Ford that starred Henry Fonda as Tom Joad and which won Jane Darwell an Academy Award for her portrayal of Ma Joad. The book was also the source for the Tony Award-winning Broadway play. New York: The Viking Press,, 1939. Octavo. Original tan cloth, titles to spine and pictorial decoration across boards and spine in brown, sheet music endpapers, top edge yellow. With the dust jacket. An excellent copy in the little rubbed and frayed dust jacket with a single tape repair to the verso. First edition, first printing. The Viking Press, New York, 1939 First Edition, First Printing. This ORIGINAL First Issue dustjacket has the words "First Edition" printed on the front flap with light wear to the spine and edges. The book is in nice shape. The binding is tight with minor wear to the boards. The pages are clean with slight wear. There is NO writing, marks or bookplates in the book. A collectable copy of this TRUE FIRST EDITION with the words "FIRST PUBLISHED IN APRIL 1939" printed on the copyright page.. 1st Edition. Hardcover. Near Fine/Near Fine. New York: Viking Press, 1939. First Edition. Near Fine/Very Good +. A Near Fine copy of the book with the spine a bit cocked and the top-stain dulled. In a Very Good+ dust jacket with some faint dampstains at the flap folds and one small chip at the lower corner, otherwise a pretty handsome copy. Steinbeck's classic account of the Dust Bowl and Depression era struggle of the Joad family, "The Grapes of Wrath" is a quintessential American classic. It would win both the National Book Award and Pulitzer Prize and the Nobel Prize committee would refer to it as Steinbeck's "epic chronicle" upon giving him the award in 1962. The book was the best-selling novel of 1939 and became instantly controversial upon its release for its depiction of farmers and worker rights. Of course, "The Grapes of Wrath" was also adapted into the classic 1940 film, directed by John Ford and starring Henry Fonda, which was one of the first films selected by The Library of Congress for preservation in the United States National Film Registry. "It is a very long novel, the longest that Steinbeck has written, and yet it reads as if it had been composed in a flash, ripped off the typewriter and delivered to the public as an ultimatum." (Contemporary New York Times Review). Near Fine in Very Good + dust jacket. Viking Press, 1939 FIRST EDITION of John Steinbeck's The Grapes of Wrath. Published in New York by The Viking Press in 1939. First edition, "First Published in April1939" stated on copyright page, and "First Edition" stated on bottom of front flap. Book near fine, with a little binding glue showing through paste-downs, title page separated from previous page. DJ very good, with some chipping at spine ends and corners, a small piece missing at top of spine, spine sun-faded, a little wearing along top and bottom edges and hinges, small closed tear at top of front dj, and closed tear and crease from fold on top of rear dj. DJ is price-clipped. Comes in custom-made cloth slipcase.. 1st Edition. Hardcover. Near Fine/Very Good. New York: The Viking Press,, May 1939. Octavo (202 x 133 mm). Publisher's presentation binding of dark blue half morocco, titles to spine gilt, author's name gilt on brown ground, greyish-tan cloth sides, grey endpapers, top edge gilt. A little rubbing to spine and extremities, endpapers tanned from turn-ins, small chips to the edges of a few leaves at rear. An excellent copy. One of ten copies specially bound for presentation at the request of the author, here with the printed presentation leaf left blank. This is a fifth impression of the first edition, printed in May, only a month after the first impression. first edition. NY, Viking, 1939, first edition, first printing, dust jacket. Hardcover. No book is more identified with John Steinbeck than this masterpiece which won the Pulitzer Prize for fiction and which was the source for the film version directed by John Ford that starred Henry Fonda as Tom Joad and which won Jane Darwell an Academy Award for her portrayal of Ma Joad, the book was also the source for the Tony Award-winning Broadway play, one of the true high spots of 20th Century literature, jacket designed by Elmer Hader, Goldstone & Payne A12a, see Morrow 107. Slight toning to spine of book, else a very solid copy in a very good jacket with some chips at the top of the spine panel and a three-inch separation along the front jacket fold. New York: The Viking Press, 1939. First edition, with "First Published in April 1939" on copyright page and first edition notice on the front flap of the dust jacket. Octavo, original beige cloth. Near fine in a near fine dust jacket with some light wear to the extremities. Jacket design by Elmer Hader. "The Grapes of Wrath is the kind of art thats poured out of a crucible in which are mingled pity and indignation Its power and importance do not lie in its political insight but in its intense humanity [It] is the American novel of the season, probably the year, possibly the decade" (Clifton Fadiman). It is the basis for the 1940 John Ford directed film, bearing the same name starring Henry Fonda. It is widely considered as one of the greatest American films of all time. In 1989, this film was one of the first 25 films to be selected for preservation in the United States National Film Registry by the Library of Congress as being "culturally, historically, or aesthetically significant." Listed by Modern Library as one of the 100 best novels of the twentieth century. New York: Viking Press, 1939. First Edition. 8vo, 619pp. ; VG/VG; dust jacket spine tan and pictorial with blue and black lettering; dust jacket protected with a mylr covering, price cut; front flap states first edition; stamp on front flap reading "$275"; mild wear to dust jacket, including a minuscule tear on top edge of front cover, mild wear to corners, head and tail of spine; copyright page states "First published in April 1939"; endpapers with "Battle Hymn of the Republic;" mild spotting to fore edge of text block; minor foxing to endpapers, interior clean; RD Consignment; shelved Case #2. Shelved Dupont Bookstore. Viking, 1939 A fine first edition in a very good first edition dust jacket with small tape repair inside of jacket not visible on outside of jacket. First Edition slug on front flap. Housed in a custom-made collector's slipcase.. 1st Edition. Hardcover. Fine/Very Good. New York: The Viking Press, 1939. First Edition. Cloth. Very good/very good. Octavo, 619pp. Original gray cloth covers, illustrated end papers with "Battle Hymn of the Republic." Tight bindings and clean pages, with light age toning. Original dust jacket, with "First Edition" on front flap, lower corner. Unclipped with $2.75 price tag on front flap, light toning to spine. Chipping to dust jacket along top edge of spine, impacting "The" on spine. Winner of the National Book Award for fiction and the Pulitzer Prize. This book follows the story of a poor family of tenant farmers through the economic turmoil of the Great Depression. An important piece of American literature. New York: Viking Press, 1939. First Edition / First Printing. Hardcover. Book has faint soiling to the exterior and light foxing to page edges. There's a minor corner crease to the front free-endpaper. Spine of jacket is darkened, and there is minor shelf wear to extremities with slight loss at jacket folds. Overall, very good+ in like dj. An attractive copy.. First Edition / First Printing. Hardcover. A Novel. Steinbeck's Pulitzer Prize-winning classic. One of the great American novels and collecting highspots of the 20th century. New York: Viking, 1939. First Edition, First Issue. Fine clean copy in a very good dust jacket with a few small chips, a few tiny tears, and darkening at the spine. Winner of the Pulitzer Prize. An American literary landmark and the basis of the acclaimed film starring Henry Fonda directed by John Ford. New York: Viking Press,, 1939. Octavo. Finely bound by the Chelsea Bindery in dark green morocco, titles and decoration to spine gilt, raised bands, single rule to boards gilt, twin rule to turn-ins, decorative endpapers, gilt edges. A fine copy. First edition, first printing.